Your friendly Ghost from Destiny 2 can help you with the game in real life, all thanks to the power of Amazon’s Alexa. A new Alexa skill will let players ask Ghost directly for guidance on the current mission, information on weapons, abilities and the game’s lore, to tell the player which friends are online, and for equipment and load-out management. 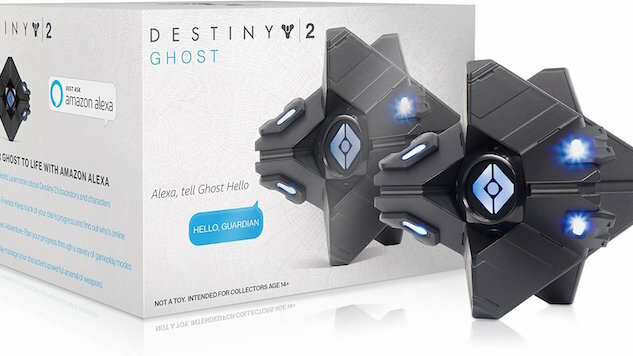 If players want to go even more over-the-top with this, Amazon has speakers modeled after Ghost available for preorder. These Ghosts do not host Alexa directly, but rather connect with Alexa devices through Wi-Fi, creating the facade that players are talking to their very own real-life ghost. Now that’s some real immersion there. All the Alexa features require are the Destiny 2 game and an Alexa device such as the Amazon Echo. The Ghost Skill is available for download right now. The Ghost speaker will begin to ship on Dec. 19, if you’re willing to allow Nolan North into your home. Watch the video below for a demonstration on how this all works.